From Japan, Kaori Naka is a dynamic dancer in Guru Debaprasad Das style. 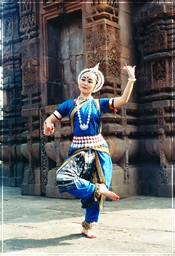 Kaori has been learning Odissi dance from Guru Gajendra Kumar Panda, yet is still seeking the elusive heart of Odissi. Specializing in installation and communication art, Kaori has also studied Butoh, Yoga, and expressive art therapy. In addition, Kaori is fascinated by animism and other forms of Asian dance. After graduating with a Masters Degree in Arts, Kaori trained in Canada at Chitrelekha Dance Academy. Thanks to a generous scholarship from the Indian Council for Cultural Relations, Kaori was given the opportunity to study in Delhi under Guru Kavita Dwibedi. Kaori currently runs her own school, Debadhara Yoga & Odissi in Japan (http://www.debadhara.com). Odissi is an Indian Classical Dance form which originates from Orissa (Eastern India). The oldest sculptural evidence of Odissi dance is Rani Gumpha caves 2nd BC. Now it is known all over the world, but it was only rediscovered some 55 years ago. Odissi gurus such as Panckaj Charan Das, Kelucharan Mohapatra and the Debaprasad Das was the first to put Odissi on the world dance map. Odissi is marked by the Tribhanga position, the three bodily bends of the head, torse and hip. This position gives Odissi the characteristic lyrical and sensuous quality. The strong symmetrical Chouka position on the other hand gives it the tandava strength. The Chouka imitates the stance of Lord Jagannath, the presiding deity of the holy city of Puri. 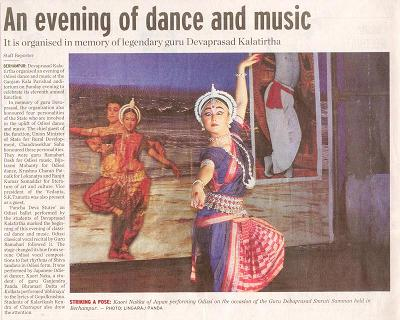 Tridhara is a pioneering organization which uphold the unique style of Late Guru Debaprasad Das who was among the notable Gurus whose sincere and great efforts to revive the classical Odissi Dance form took initiatives for the reconstruction and popularization of Odissi. His was a dynamic force whose dance captured not only Odissi’s sensuous lyrical form, but was also infused with the wild, vigorous spirit of tribal dance and tantric forms. The Debaprasad Gharana of Odissi retains its pristine purity in its undiluted form. The style has element of rawness in it. Debaprasad believed that Odissi as a dance form has evolved from tribal, folk and classical culture and thus he conceptualized Tridhara. Now his able and efficient disciple Guru Gajendra Kumar Panda is the director of Tridhara. under under Guru Kalashiri ChitralekhaPatnaik Guru Ellora Patnaik and Guru Sri Debraj Patnaik.